Award winning Vlogger The Geocaching Doc recently found the oldest and first Geocache in his home State of Minnesota, GC9FF, Alvin’s Phone Line (Placed 11/5/2000), and posted the video to his account on December 10th, 2016. 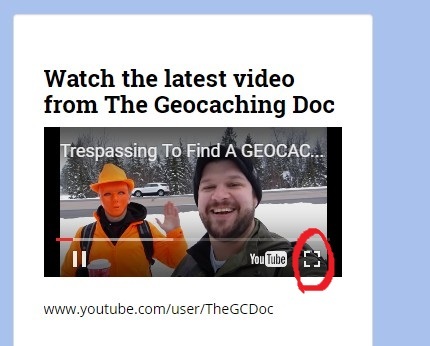 Here is a link to the video, as the latest video from the Geocaching Doc to the right of this post obviously updates to his latest video when he posts a new one. With him in the screen shot is a new face on the Geocaching Vlogging scene, SoDakZak. As you can see, he can be zany, shown taking the “wear orange to this cache” warning on the cache page to the extreme. Here is the link to SoDakZak’s YouTube Channel. They made a great video together, check it out, whether it still appears on our sidebar when you see this post, or you have to use the direct link above. We’d also like to point out, because we do not believe we ever have, that you can watch the Doc’s videos in full screen mode on this blog; you don’t have to watch them 4″ x 2″! See the red circled rectangular box in the screen shot above? Click that to go to full screen mode, and hit escape on your keyboard to exit full screen mode.